Home Grown Apothecary was founded by a collective of people that believe in improving wellness through diet and alternative medications, with a philosophy of keeping all practices as organic and eco-conscious as possible. With the owners being passionate snow sport enthusiasts and long time residents of Mt. Hood, an awareness of climate change is essential in preserving the vitality of the snow and mountains for generations to come. Our intentions are to help people avoid the use of pharmaceuticals by providing people over the age of 21 a variety of alternatives. We offer the best in cannabis, edibles, topicals, tinctures, extracts and concentrates, all thoroughly sourced to meet our health, wellness and sustainability standards. Our shop also offers you a full apothecary, featuring a wide selection of non-cannabis herbs and concoctions. This area is cared for by our in-house herbalist, Tania, founder of Mossy Tonics. She formulates herbal tinctures, teas and remedies to complete our health and wellness package. Everything is our Apothecary is organic, wild and/or ethically harvested. 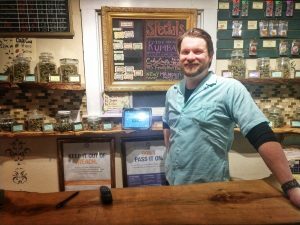 We would like to welcome anyone over the age of 21, with a valid government issued ID, to come visit our dispensary on 1937 NE Pacific St. in Portland. With our “welcome home” feel, friendly atmosphere, and knowledgeable staff, any first time experience will be comfortable and smooth. Once you visit us for the first time you will never go back to anything that is not Home Grown. All of the cannabis here at Home Grown is grown locally, sustainably and to the highest organic standards. By organic standards we mean grown in live soil with no weird chemicals. Organic soils and fertilizers in combination with that home grown love help the herbs provide patients with maximum medicinal capabilities. All products must go through our vigorous vetting process before being store approved. The energy used from seed to patient is renewable energy. All of our farms are working towards being, if not already, Negative Water and Energy Business. Meeting our high ethical standards. All paper products in the facility are made of recycled paper with a minimum of 30% post consumer products. Recycling programs are established to limit product-packaging waste and reduce consumerism. We will take your #5 plastics back! All the furniture and shelving in our building was built with refurbished/up-cycled woods.